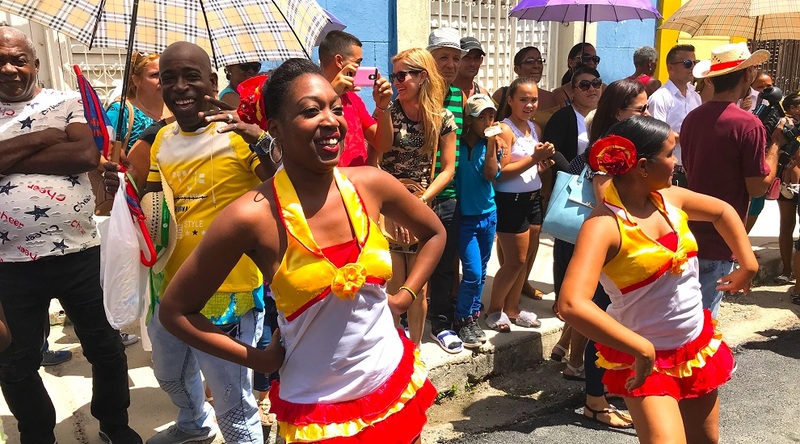 It’s not just the heat from the Caribbean sun that can be felt wandering the dusty backstreets of Havana – the warmth of the Cuban people is just as tangible. All smiles and waves, it’s as if the obvious poverty doesn’t bother them. Not for that moment, as we pass, anyway – maybe not ever. In passing, all we get is a glimpse. We can only really guess the truth of it all. But in a place where being poor is the norm for most families and the average income is a shocking $25 per month, you’d imagine they might be more miserable. Buildings that are crumbling in a way that makes for nice photos but not-so-nice homes, provide the backdrop for the lively townsfolk. Not a sad face among them. On our first night there, one of our group was taken ill in a bar and the staff were amazing. It was clear they knew their first aid and did everything in their power to make things right. The Cuban family on the next table were also concerned and, despite having had their evening interrupted, still asked if everything was OK and offered to help in whatever way they could. In the UK, people would turn a blind eye. In the USA, they’d sue. 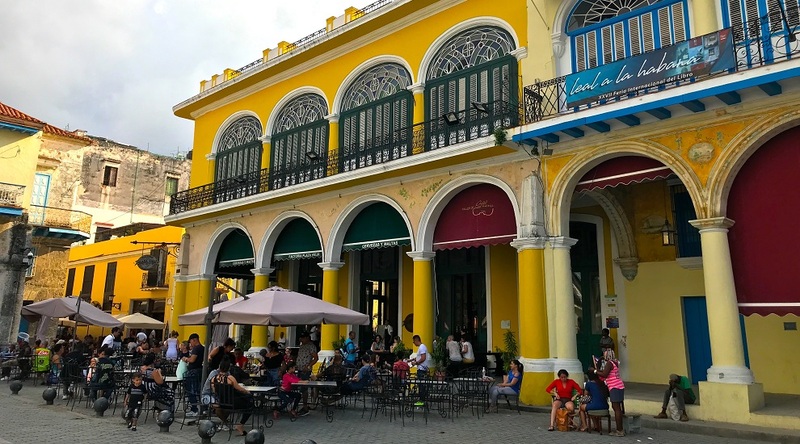 On the outskirts of town on the Malecón, at the Iberostar Habana Riviera, a faded hotel with more than the faintest whiff of the 60s about it, the staff couldn’t be more friendly and helpful. The floor-to-ceiling windows in the foyer not only framed the passing vintage cars and across-the-road sea looking out towards Miami, but also served to reflect the warmth and smiles from inside the building. 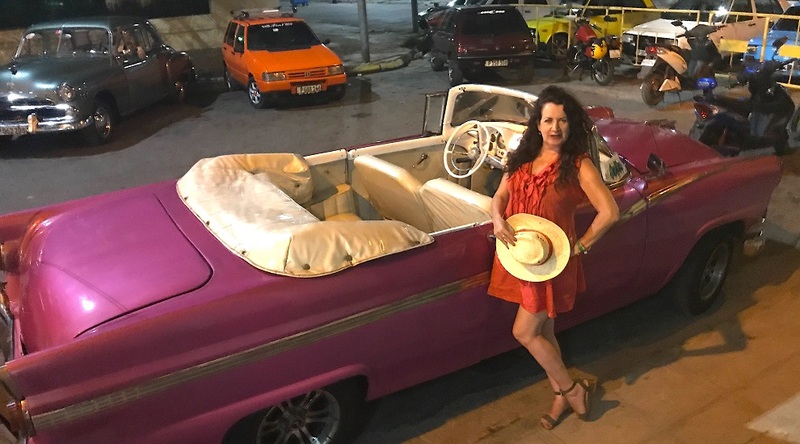 I go for a ride around central Havana in a pink Cadillac. Like you do. At 62 years old, she wasn’t doing too badly (the car, not me). OK, so the gears crunched a little and the front passenger door flew open halfway up a dual carriageway, but I still felt like a modern-day Lady Penelope. OK, so the gears crunched a little and the front passenger door flew open halfway up a dual carriageway, but I still felt like a modern-day Lady Penelope. I ask my tour guide – a beautiful lady in her fifties, sat next to me on the leather back seat – what makes the Cuban people so happy? She tells me the average age at death of a Cuban is 79.5, which reminds me of the tiny 88-year-old Cuban lady who sat next to me on the eight-hour flight from Gatwick, (“Call me Mama,” she’d chuckled, as she swept leftover freebies from my fold-down table into the capacious bag at her feet) and that the country has the highest doctor-to-patient ratio in the entire world, with 58 doctors to every 10,000 people, compared to just under 21 per 10,000 in the UK. We talk about mental health and I mention how joyful most of the natives appear to be. She says it’s probably because they live simple lives. It’s the complexity of modern-day living that causes sad faces and stress-related illness, she reckons. Across the street, on a patch of green, are a group of teenagers, kicking a ball around. Along a bit further are some young people sat on the back of a bench, laughing and chatting. With the internet introduced a mere three years ago and wi-fi available in only a few places, there’s not a mobile phone in sight. These kids are actually talking to each other (“in real life,” as our kids might say) and looking at each other (using their eyes, not via Instagram pics!). They are interacting the old-fashioned way and look very happy about it. No frowny brows, squinty eyes and hunched shoulders; the youth of Cuba look carefree, un-addled and – dare I say it? – normal. In the bars, there is dancing, singing, smoking, drinking, the air around buzzing with chatter and music. No-one sits still for long. The constant movement is mesmerising. It’s actually quite nice not to be constantly bombarded with billboards, telling us what to buy and how to look. She also points out the lack of advertising: in fact you’re more likely to see images of Che Guevara, Fidel Castro and John Lennon than posters showing stuff available to buy. This is thanks to Cuba being a socialist country and a one-party government (led by Miguel Diaz Canel) who don’t allow any private companies to promote anything that might be viewed as ‘propaganda’. I must say that it’s actually quite nice not to be constantly bombarded with billboards, telling us what to buy and how to look. Later in the holiday, at the beautiful Dhawa Hotel at Cayo Santa Maria, the locals were as friendly, kind and laid-back as they were in Havana. As a woman, I noticed – and I feel almost sexist for saying this, but any woman who’s travelled abroad especially alone will know exactly what I mean – that the men were respectful and polite and not even in the slightest bit flirtatious. There seemed to be fewer rules about the small things – smoking, crossing the road, drinking – and, whereas at home, we often feel under scrutiny, in Cuba that feeling was absent. After all we are told about the place, I was surprised to feel that way. 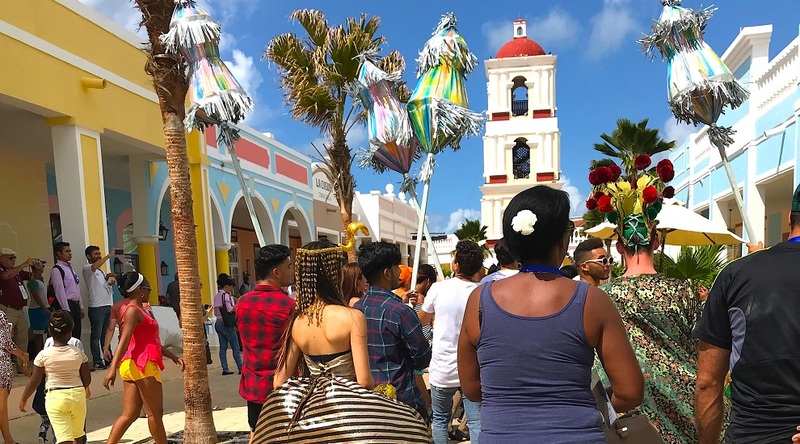 Adding it all together, I come to the conclusion that the happiness, health and kindness of Cuban people has much to do with the way they live – in a simple way, low on technology, money and advertising, high on fresh air, movement and life. To be happy, perhaps we need to take a step back and follow their lead and, strange dance move though that might be, maybe going backwards for a bit is the only way forward! So stop fretting so much, have a few cigars, drink some rum, smile big smiles and make like the Cubans. Just remember to dance, sing and laugh at every opportunity. Oh, and to leave your phone at home. Going to Cuba? Then make sure you…. … while you’re in Havana, pop along to the John Lennon Memorial Park and sit next to a bronze statue of the man himself. You can also talk to Aleeda Rodriguez Perasa, a lady employed by the government to specifically guard the statue’s removable glasses!